The feather trend is still going strong with feathers popping up everywhere we turn, from home decor to fashion and more. We're excited to bring you our own twist, in true Papertrey style! Sit back and relax, as we present Feather Finery from the whole team! Take this stylish feather set from classic to modern with the simple two-step stamping options available. Just use the graceful feathers as is for a simple, timeless design. Or add the dotted layer for a trendy take on this popular design element. The sentiments are a great complement to the images and say just the right thing. Feather Finery will be available for purchase on January 15th. Feather Finery contains a total of 23 images. The largest feather measures 5-1/2" x 2-1/4". The medium feather measures 3-1/2" x 1-3/4". The smallest feather measures 2-1/4" x 1-1/4". The largest assembled bird measures 1-1/2" x 1". The "tickled pink" sentiment measures 1-1/2" 1/2". "About your big news." measures 1-3/4" x 1/8". "You be the bird…" measures 2" x 1". One of my favorite things about this new set is the size of the largest feather. It easily can stand alone on an A2 card and fill a lot of space which helps to be able to create relatively simple cards. On this card I stamped a single large feather in Charcoal Palette ink. I then added a few strokes of watered down Summer Sunrise ink refill, along with a few splatters. For additional splashes of color, I stamped various Mini Blooms using Orange Zest, Pure Poppy and Raspberry Fizz. I love the way these strokes just move your eye across the cover. This sentiment from Happy Trails was a perfect finish, stamped in True Black. I also used a ruler and black pen to add two lines underneath to help add visual weight and balance. A Raspberry Fizz card base finishes it off. I love how this turned out and I am already thinking about other types of images that could be added to paint strokes in this manner along with the feather. Like various sizes of stars, hearts, polka dots or letters! I have found myself using a lot of white lately so I wanted to pull out my neglected black. I've always loved the look of gold embossing on black and kept things simple with that technique on this card. I designed the smallest feather in this set on a tight curve radius so that it could be used above and below a sentiment like this and form a circle of sorts. I stamped the sentiment first and then added the feathers. They were all heat embossed with Gold Filigree Embossing Powder. I cut the card front a bit short and prepped a separate black card base. I added Scor-tape to the bottom edge of the card base and pressed crushed glass glitter into it. then I adhered the embossed card front in place with foam tape. The little lip hanging over the glitter edge gives it a nice clean finish. Now for something a bit more simple, a one layer card. I stamped the large feather in Ocean Tides and the medium feather in Aqua Mist. I then added the dotted layer on top of each feather. I decided to experiement and I used Liquid Pearls on all of the dots, which was a bit time consuming. After I was done and everything had dried, I decided I probably would have had a very similar effect by heat embossing. So you may want to do that instead if you opt to recreate this design! I punched a 1/4" circle from the edge of the card and tied it with silver floss. I purposely cut the ends a bit randomly to have more of a *feathered* look. The sentiment, also from Feather Finery, was done in Charcoal Palette ink. And I neglected to mention earlier that this was all done on Rustic White cardstock. It still amazes me how many different looks you can get from these feather with just some little touches. 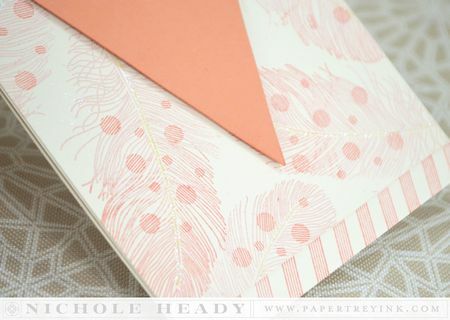 I stamped the medium feather repeatedly on this piece of Rustic White cardstock using a combination of Sweet Blush and Melon Berry inks. I then went back in and added the delicately striped polka dots. The stripes that I incorporated into the polka dots are the same weight as the lines used in drawing the feather, so they really look like they are part of the original image. I used 2-way glue to add a bit of Prisma Glitter to the center of each feather too. I die-cut a Basic Banner triangle from Melon Berry cardstock and heat embossed it with these fun sentiments from Feather Finery. I aslo added the two dotted lines between the two using a small image from Star Gazer. The top edge of the banner was die-cut with Stitching Lines, which I stitched with silver floss. I cut back the bottom of the feathered front cover block a bit and then created a separate card base from Rustic White cardstock. Along the bottom edge of this I added stamped lines using one of the little chervons from Background Basics: Diagonals Additions. That small stamp made that design detail easy and effortless and I will definitely be doing it more often! For my last card today I decided to pull out my Perfect Pearls and use a peacock feather as my inspiration. 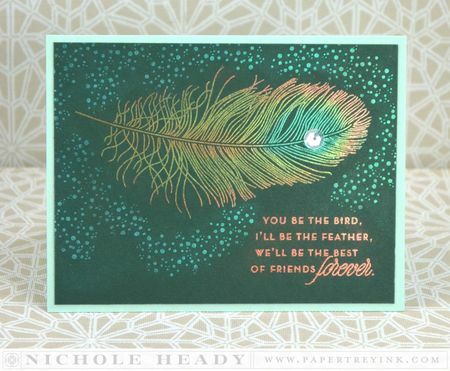 I started with a block of Pinefeather cardstock and stamped the large feather in Perfect Medium. I added Turquoise Perfect Pearls in a small area up near the tip like you would find on a peacock. I then added Kiwi and Copper around that. The single sequin was adhered with a mini glue dot. I used the dotted layer, originally designed to be used along with the small feather, to add pattern around the feather. These were brushed with Turquoise as well. The sentiment was stamped in Perfect Medium as well and brushed with Copper. I adhered the finished Pinefeather blcok to an Aqua Mist card base. I just love how these two colors pair up and the way it helps to bring out the Turquoise Perfect Pearls. Now that you have seen a few of my creations, here are some of the amazing things that the team has created! I asked each of them to create one simple card and then a second version of the project with a little extra jazz. These projects will show you that whether you prefer CAS or more detailed cards, this set is ideal! CLICK HERE to see more from Laura Bassen. I hope you have enjoyed all these amazing creations that both the team and I have shared with you today! Are you excited about the feather trend? Can you see yourself using these fabulous feathers yourself? We would love to hear your initial thoughts on everything we introduced! Please leave a comment on this post to tell us what you think of the new products and you will be eligible to win big! You have until 7am EST, January 14th to leave your comment and be eligible to win. Only one comment per person please. One randomly selected winner will be announced on our January Release Winners Page before noon EST the same day. Thank you for stopping by today and best of luck with the contest! CLICK HERE to see more from Tiffany Pastor. FINISHED SIZE: 4" x 5-1/2"
The sentiments in this set are wonderful; I love them. The feathers are so delicate and pretty! Love them? I’ve been dying for a feather set! This one is beautiful! Love love love this set. 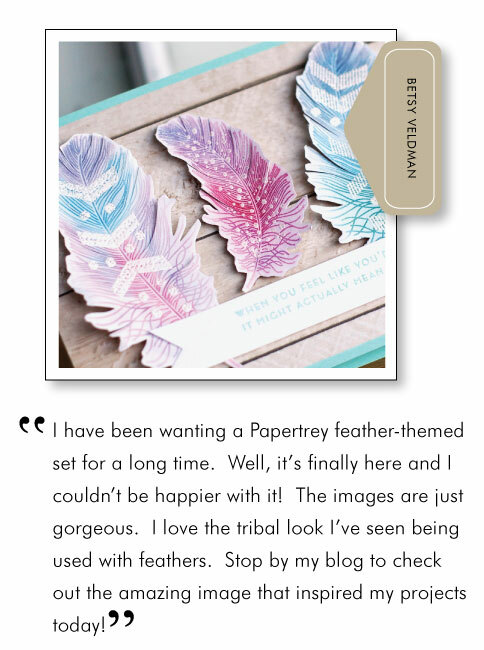 I’ve been waiting for PTI to do a feather set and you definitely hit the nail on the head- it’s gorgeous! The peacock feather is amazing, and I like the “tickled pink” sentiment. Beautiful samples here and also from the DT! The detail on the feather stamps is amazing. Beautiful cards! The feather images are gorgeous! A nice addition to the papertrey lineup. I love these dies and stamps! Gorgeous! Amd the cards are stunning and inspiring! I love these feathers, they are beautiful! Gorgeous projects! I haven’t jumped on the feather trend yet because, frankly, I haven’t been “tickled” by any other set. I LOVE this one! Stunning feathers! Love the sentiments and the detail in the dies! Such detail and wonderful sentiments! Awesome projects everyone! Just as Betsy said, I’ve been waiting for a set like this for some time! Hooray!! Feather Finery is so beautiful and I am so glad it includes some birds! The feather adds such a beautiful touch. Oooooooooooo! I am so in LOVE with feathers right now … can’t wait for release day!! The cards are just beautiful. Can’t wait to get this set!! What an amazing group of projects by you and the DT! Love these feathers; the dots are a stunning addition! 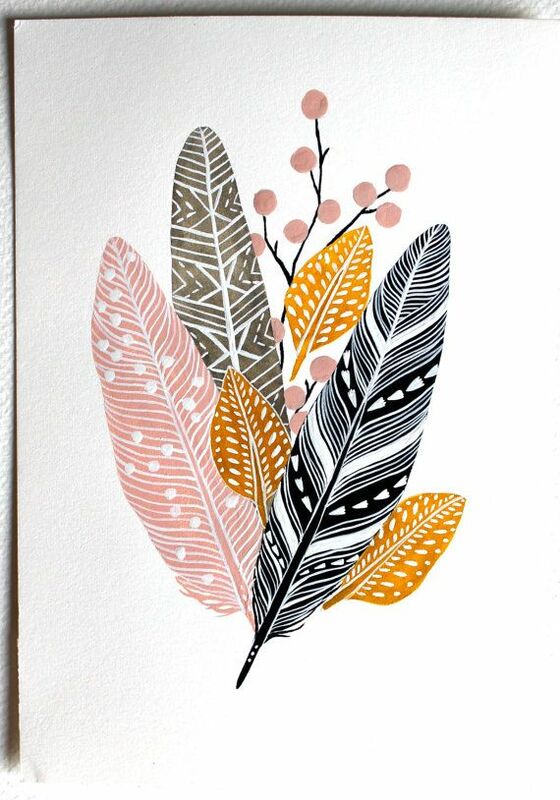 Feathers + watercolors = love. I absolutely adore this set! Each project is a gem. This will be my first PTI purchase of the new year, for sure! Your feather card on the black card stock with perfect pearls is stunning! Can’t wait to see the entire set. Beautiful feather set, I love the versatility of the stamps bring able to stand alone or as a background. Love, love, LOVE these feathers! I have been waiting for the right ones and these are perfect. I love the black and gold card with that awesome sentiment. Beautiful feathers, I love how they aren’t perfectly symmetrical just like real feathers! Great cards. I love the feathers. I really like the new feather set – especially the sentiments ! Simply Gorgeous. What a fun way to great the week with a new 2 step stamp. I absolutely love that peacock feather card…stunning…well done! Love all the feather inspiration! This is a fun set for sure! Beautiful cards! The feather images from this set are gorgeous! I’ve not been too impressed by the feather trend – until now that is! So gorgeous! What a gorgeous feather set! So excited about it! Nichole, this set is so versatile! I love all of the different looks. I’m always inspired by you girls. But this time I’m absolutely blown away. I LOVE the samples that were shown here and I hope to give this watercolor trend a try very soon with this gorgeous set. Simply gorgeous, my faves are the black and gold and the last one with Perfect Pearls.. WOW! The dots on the feathers when stamped look so amazing too! Can’t wait to check out the DT’s work! So much amazing detail on these stamps! I love the beautiful one layer cards from all of the design team. WOW! The idea of feathers was not that interesting to me, but you have changed my mind. Absolutely beautiful projects! This set looks fabulous! And the samples are to die for! Everything we expect from PTI: innovative, elegant, classic, trendy, versatile. The feathers are gorgeous and I love seeing them showcased in so many different ways. BRAVO! Love love love those feathers. There are already a lot of feathers out there, but once again – you have done it best! Those dots on top are a beautiful addition. Feather Finery is beautiful and I love every single project today! Way to go Design Team!!!!! Love the projects. 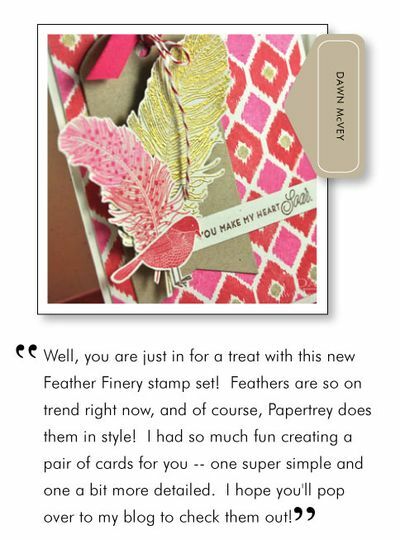 The Feather Finery stamps are a must have. Absolutely gorgeous!!! I love these!!! I am in deep love with these feathery products! Such beautiful designs and the projects shown are perfectly lovely! Thanks so much for creating more products I can look forward to creating with! I have been waiting for some feather stamps! Love all the new items…you are so on trend! The detail in the feather set is unreal! What a great set. So pretty and delicate. Oh Wow! This is indeed a beautiful stamp set & looking at all the designers’ marvelous works are just awe-inspiring! Great job ladies! The peacock feather card is absolutely stunning. I sketch feathers all the time!! I would live this set… Its unique and versatile!!! Super excited to get my hands on the Feather Finery set – it’s GORGEOUS! What a beautiful set! I love feathers! Can’t wait! Yay! Feather Finery! I’ve been holding off buying other feather stamp sets because I’ve been waiting for PTI to release one. I’ll be getting this and the dies for sure! I’ve been waiting for PTI to do a feather set.And now it’s there. I LOVE IT! I NEED IT! Love all the detail on the new feather set. 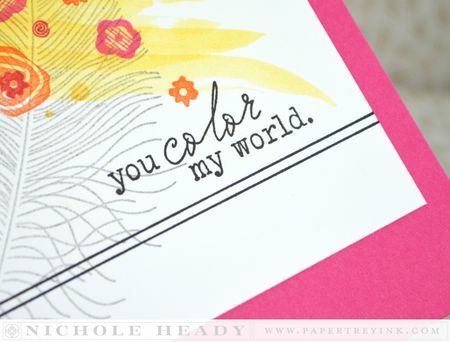 Love Laura’s watercolor card – it is awesome! Beautiful feather examples and love this set…so different from anything I own already. Great ideas! I love group post day, and I love these gorgeous feathers and coordinating dies! Absolutely LOVING the feathers ! 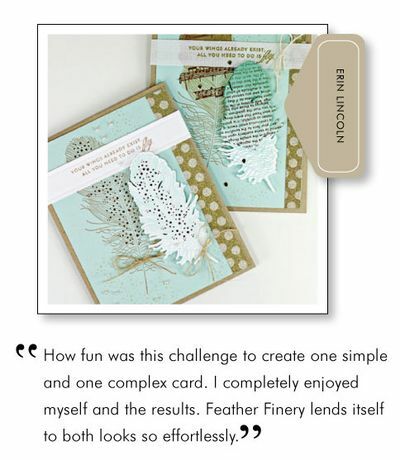 The projects created with the Feather Finery set are beautiful. I NEED that set! Feathers are beautiful, the sentiments are great. I just don’t get the feather trend. But there are plenty of other things I love from this release. I love love love the feather set! That is moving to the top of my wish list! 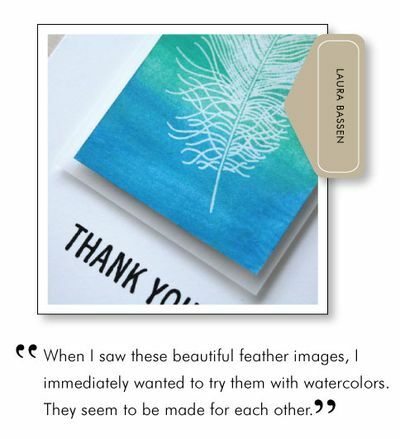 I have been eying feathers, but with these beautiful sentiments it is a must have stamp set! And die too! What I love most about this set – aside from how beautiful and versatile they are – is the opportunity they offer to expand my creativity. I’m feeling a bit in a ‘card-making rut’; the feathers – even simply admiring the DT creations – has sparked ideas. Gorgeous inspiration here. Wow, very intricate details in this stamp set! Love the DT creations! i’ve never been that enthused about the feather trend, but this new set has found a convert – all the cards from you and the team are so inspiring. These feathers are spot on!! Love them! Oh, this set looks so fabulous, Nichole!! And I love that there are coordinating dies! I have held off purchasing a feather set in the hopes that PTI would do one. Oh my! So glad I waited!!! This just might be my favorite set that you have ever released, I LOVE it! Love the new releases! Can’t wait to order. Like how big the feathers are!! Looks like a great set!! What a gorgeous feather set! Thanks so much for all the beautiful inspiration! Pretty feathers–I like the gold embossed ones. Another gorgeous addition! Love the feathers! Wow! These feathers are gorgeous! You gals are all so very creative. Great job! Yay!!! I was hoping for feathers! The samples are gorgeous! So versatile! Another great stamp set. Love, love, loving those feathers!! This set is gorgeous! Lovely work by everyone! Beautiful set…..and great cards girls! I love this trend. Great job! The stamps are lovely. Gorgeous set and projects from the team! O M G these feathers are gorgeous!!!! Finally, I get to see this exquisite set “showcased”! Each and every project is just beautiful! The feathers are so pretty and graceful, I don’t any card design will go wrong. Bravo!! I have to have this set and dies! All of your feather cards are wonderful! Not sure if the feather thing is for me, but the samples are inspiring. These feather images are so floaty and dreamy! Really really lovely. Wow – I love the projects today! This one is definitely going in my cart! The feathers are so fun. Beautiful cards. 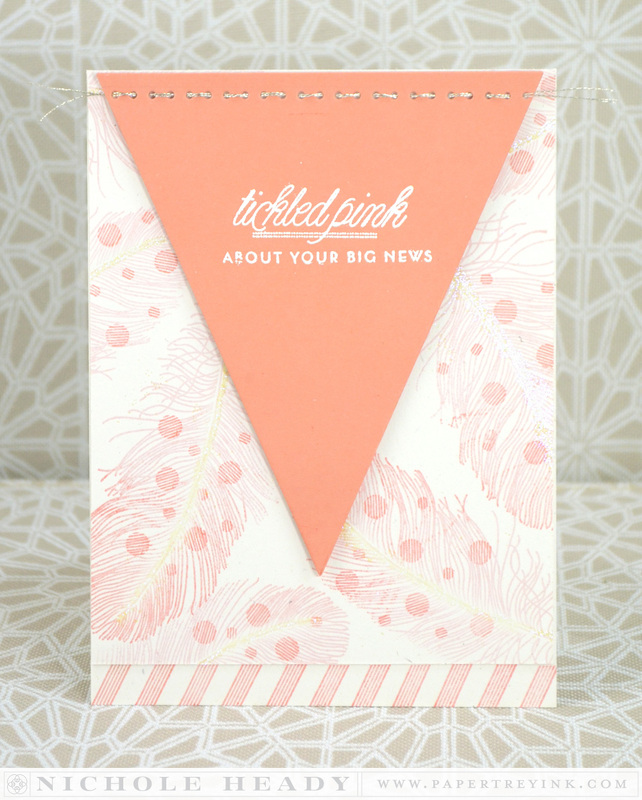 Tickled pink with this new Feather set and dies!! I have only a one word comment about the feathers – “OMG”! PTI, you’ve done it again!! Absolutely stunning! The feathers are stunning.They look amazing when embossed.I’love to have them in my stash of stamps! Feather Finery is such a beautiful set, each project from the team just kept getting better and better. This may just make me cave in and be my first buy of the new year, I’m trying to be strong! I’ve been waiting for PTI feathers and you have NOT disappointed me in your set – what beautiful cards they make! Very pretty cards. Love the feathers. OOOOH! Feather Finery is at the top of my Wish List!!!! Very pretty cards. I especially like the last one on the Pinefeather cardstock. Oh – I LOVE feathers! I can tell I won’t be able to resist these at all! LOVE all the samples – and variety!!! The feather motif is so neat! It looks so real!! Oh, what a wonderful stamp set and matching dies! Love it. Love the details on the feathers. Can’t wait to get the set! Gorgeous feathers and projects made with them! The Feather Finery set is GORGEOUS! I have been avoiding the feather trend but this stamp set has made very excited! Your feathers are the loveliest I have seen on the market … delicate and detailed. Thanks to the whole DT for their creativity. The feathers are beautiful and so are all your cards today. Love the effect with the Perfect Pearls. This is a beautiful and trendy set, love the sentiments as well as the feather images! The design team projects are amazing as usual! 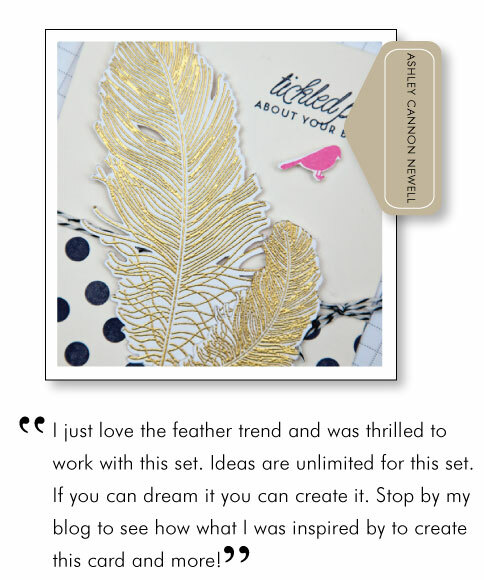 When I first saw that you were introducing a feather set, I thought “ok” – but now that I see your samples – I simply LOVE LOVE LOVE it! You are always so creativly inspiring! Best feather set ever! Oh, how I love this! OMG, this is LOVE at first sight! Love the new feathers’ set!!! It goes directly into my wish list! What beautiful feathers! Your peacock card is my favorite. Fabulous projects for everyone today! that feather set is going to get lots of mileage, I think. Great inspiration from the team!! The feathers are gorgeous! Love the feathers! Such fabulous card examples! Can’t wait until the 15th! Very pretty. May have to put this set on my wish list to make cards for my sister in law as her last name is Peacock. Fun projects today. How awesome is this!!!! Love those feathers! Love the way you uses the Perfect Pearls powder on them. Beautiful!!!!! This is such a beautiful set. So elegant. Wow. This feather set blows all other farther sets away. The detail is amazing. Gorgeous cards, design team! The cards are absolutely stunning! Fabulous job! Thanks so much! I absolutely love this set. Beautiful cards! What beautiful cards and such variety! 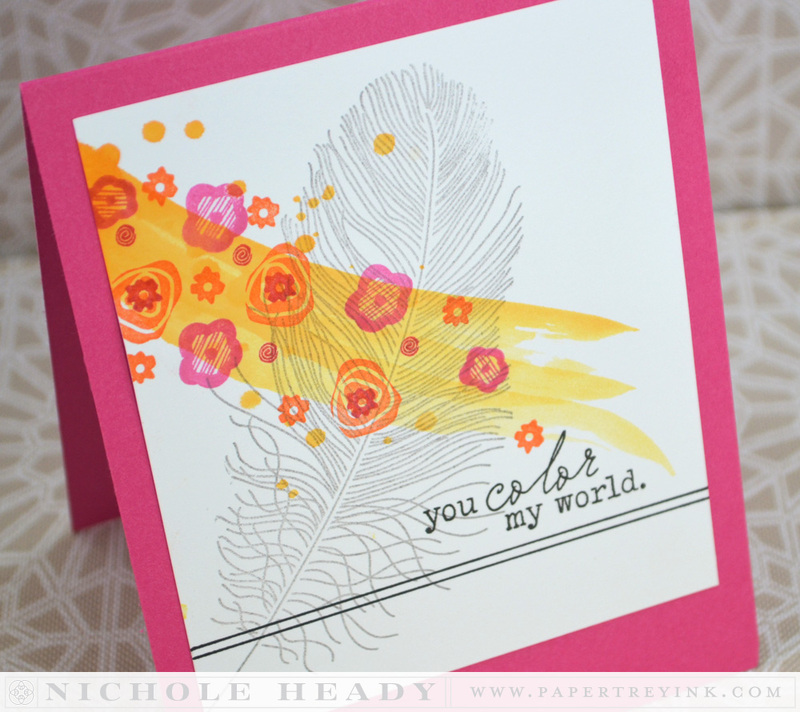 I am inspired to try the watercolor technique along with this delicate feather stamp. Thanks for sharing all the talent! I am thrilled to see the feather set and dies! These samples are lovely, and so varied! Very excited about the release this month, I got a gift certificate for my Birthday!! Woohoo!! Thanks to my stamping friend, Helen!! Beautiful feathers! I love these cards showcased today! I love all the wonderful projects with the feathers. Aren’t those little birdies so cute. And I love your tickled pink card, super projects as always. There are so many feather sets out there, and I have been waiting for just the right one….I think this is it! When I saw all your feathery goodness, Nichole, It gave my heart satisfaction as to why I’m hooked on PTI! Looks like the Feather set will be on the craft table for a long while. now to go check out everyone else’s blogs. It’ a beautiful day when it starts with beauty! What a beautiful set! The feathers are so delicate and lovely! Lovely set and beautiful creations by everyone on the design team. I’ll be honest that I have not been a big fan of the feather trends by PTI’s set is truly beautiful! Oh so pretty! I’ve been waiting for this post! Beautiful projects today … this is pure love! Wow – the DT have outdone themselves with this set – just stunning. Love the how detailed and delicate the feathers are! Beautiful samples! beautiful feathers! I especially love Laura’s….very colorful! The feathers are beautiful! Thank you for the inspiration! The feathers are just gorgeous – Love those little birds too on a few of Design Team projects! Your peacock card on pinefeather is stunning. I’ve been waiting forever for pti feather stamp set and die.you didn’t disappoint. 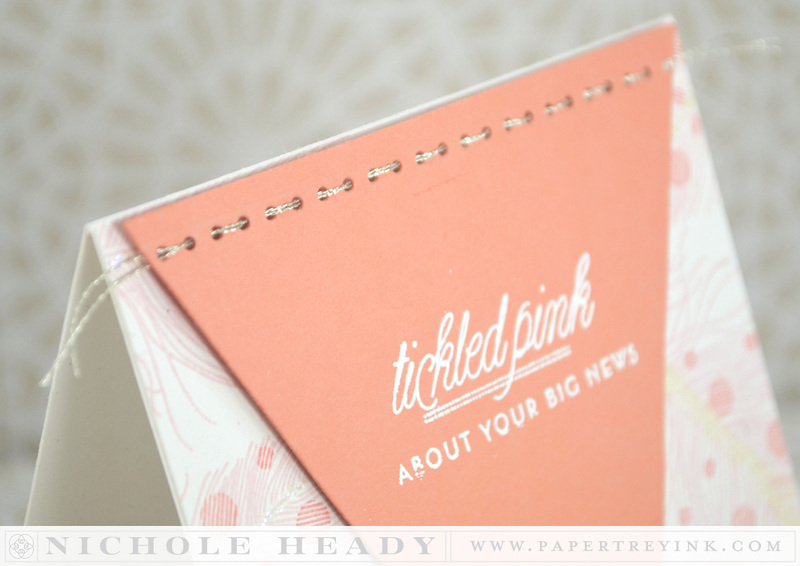 I’m definitely tickled pink by the new Feather Finery stamps and dies! The feathers are quite lovely, so detailed and so much texture with embossing them. LOVE! Fabulous work by the team with unique styles and techniques. I didn’t quite understand the feather “thing” but I do love your set. The feathers are so pretty & the sayings great. I’m very excited about this feather set! I absolutely love feathers and you’ve done a wonderful job giving them the details I’ve been looking for – especially with the dies that cut out some of the small fluffs of the feather instead of just an outline as so many others do. My son has just earned his Eagle Scout and I’m looking forward to making his thank you cards with this set! Just a thought for the future – I can’t find ANY good eagle images out there – so if you’re planning a patriotic set for July please think about including one! I am so loving all these feather cards, gorgeous! Looking forward to seeing this whole set. The feathers are so light and airy-looking! i’ts gorgeous as always!!!! want it!!! Wow, what beautiful feathers – so light and airy! Everyone did a super job of showing them off, too. Such lovely cards today! The feathers are great! Gorgeous projects by the DT showcasing these sets. Love the feather image, so detailed and pretty!!! Very pretty set! Love these feathers. these feathers are amazing. i love that they are so versatile & can be used for a girl or a masculine card. also, they can be used for so many occasions. thanks. I think all the cards and designs are absolutely beautiful! I will be placing an order again this month. You all are so inspiring and I love the feathers. Gasp…that peacock feather card is just amazing! Love this stamp and die set! WOW! I love those feathers! Great projects! These projects are gorgeous. What a marvelous set! ooooh, love those feathers! Such detail. Your cards are gorgeous! This is a “MUST HAVE” set for me. Both the stamps and the dies. I see so many possibilities. Love them! The feathers are beautiful! I especially like the peacock feather. I’m also a big fan of your one layer cards. I like the way you take a simple concept and make it look so finished. Wow the projects are great and I love the new Feather set! Beautiful inspiration cards! I love feathers in gold! wow, so many unique ways to use those feather stamps! Love all the gold! I love this trend so much and hopefully it continues for awhile because I haven’t bought stamps that I really love. This one is it! Stunning feathers…so elegant and very classy! Feathers! Who’da thunk? Love today’s projects! Such inspiration! Love the detail in the feathers! So delicate looking. Wow the Feather Finery is fabulous! Oh, these feathers are beautiful. I’ve been looking for a set and this is going to be the one! So elegant and airy! Lovely samples from the DT! Blown away!!! This set is perfection! Absolutely love this stamp set and matching dies… well worth the wait!! Can’t wait to have them in my hands soon!! This is the prettiest feather set I have seen. The samples are beautiful as always. Such a pretty stamp set! There’ve been some other feather sets but this one is the prettiest I’ve seen. Love the sentiments that go with it! Wow amazing. The feathers are so in right now, great!! The feathers look like so much fun! I especially love Danielle’s watercolor feathers. Such a fun set. Love all of the watercolor looks! oh my… this feather set is absolutely GORGEOUS!! beautiful projects! Beautiful delicate feathers! Your peacock card is amazing!! Wow I am one who isn’t all that into feathers but yours are breath taking, just beautiful. I love the looks of this set. Thanks for doing a feather set! I just love the Feather Finery stamp set. I love it for One layer cards! I am so impressed with how intricately detailed the feather images are – looks incredible embossed in in gold, embellished with Liquid Pearl dots and Perfect Pearls – I have to try those out sometime too! What a fun post to look at on this Monday morning! So much creativity was used with the new feathers! Love them! This feather set is amazing. Lovely creations by all. Thanks for sharing. I love love love the feather trend! And I’m so glad I waited on buying anyone else’s feather sets, because this one is mine for sure!! Feathers: what a wonderful idea. I can’t wait for this set to release! A feather stamp set from PTI? Yes please! This is going in my cart for sure, along with the dies! Love the large feather which is so detailed! Great and lovely illustration by the team. Wow! I love this feather set! The images are beautiful and the sentiments are wonderful. This set is definitely on my list for the 15th. All the projects highlighting this set are amazing! LOVE! LOVE! LOVE! the feathers! Will definitely add both the stamps and dies to my want list. I wish you would have shown the stamp set though… it looks like the speckles might be a separate stamp…yes? Your work today has left me speechless! Fabulous new set with so many possibilities! This feather set is awesome! Love all the cards. I love these feather stamps and what you have done with them. Those feather images are fabulous!! Great samples too! I just said yesterday that I want a feather stamp/die! Almost purchased some feather goodies yesterday, SOOOO glad I waited so I can get them PTI! LOVE them!!! Swooning over the samples! I love the images and sentiments! This is the most beautiful feather set I have even seen! Well done! Beautiful feather design! Enjoyed seeing everyone’s card creations. So pretty!! I am absolutely in LOVE with this set. Into my cart it must go! I’ve been waiting to see if PTI would make a feather set and I am so thankful that I haven’t purchased a feather set from anywhere else. Feather finery looks like another “must have” set. Love it! Great feather set and I love the sentiments too. Can’t wait to see what you have tomorrow. Absolutely gorgeous – both the stamp set and your creations! Yes, yes, yes!! I have been waiting for this and it is beyond expectation gorgeous!! Beautiful projects shared as well. I have loved the feather trend for a while but never found a rendering that I loved. I’m so glad I waited. Feather Finery is so beautiful! The design team did a fabulous job as usual. Wow! The feathers are fabulous and the stamping techniques amazing! Can’t get enough of these beautiful feathers. Just gorgeous! I loved the idea of a feather set as soon as it was ‘sneaked’ but every single feather card from the team is absolutely GORGEOUS! Every single project today by the Design Team is gorgeous! And I especially love Erin’s simple card design! Fabulous projects today. Love those feathers. Wow, the perfect pearls card is gorgeous! Have to remember to use that more often. Wow those feathers are really fine. Great projects again love them. Love the detail in the feathers…and the sentiments are perfect! Great for so many occasions. I knew I would love the feathers! Adorable! Such creativity and so unique! Thanks for all the beautiful inspiration ladies. Love the feathers! Great samples today, Ladies! Feather Finery is just what I’ve been waiting for! PTI took the feather trend and bumped it up a whole bunch of notches, of course! It’s what they do! Love PTI! This new feather set is just lovely-definitely has the PTI touch. Can’t wait until it is in my hands. Love the featheres and the cards are great. What a gorgeous set! I am so inspired to try all things ‘feather’ now. The feathers are to DIE for! The prettiest by far of any other manufacturer’s offerings! Got to have them! I am so thrilled to see more feathers! They are so dreamy to create with and the PTI team did a fab job of showcasing this gorgeous set! I really love the variety of cards the designers came up with. Each so unique and beautiful. Beautiful set and all the projects done today and the design team are so stunning!!! I was absolutely certain that no feathers would fly into my cart this month and I was so wrong. I really love the sentiments and the detail in the feathers; I was sold by the time I reached Danielle and Dawn. Thanks! The gold feathers are beautiful! Love the mix of designs in the feather set! this set is beautiful!! I have to say that I was not a fan of the whole feather thing until now. All of your projects are gorgeous! Love all the feather cards by you and the DT! How unique! Love the projects! LOVE this set! Another to add to my ever growing PTI wish list. LOVE this set. My PTI wish list keeps growing. What delicate, beautiful feathers! You have made me a fan! Your feathers are amazing and the detail is stunning. Gorgeous cards. Love how you used the whole punch with the floss. The card with the Perfect Pearls is stunning. Only you could achieve such a perfect peacock feather. Wow! Todays cards are ALL gorgeous! 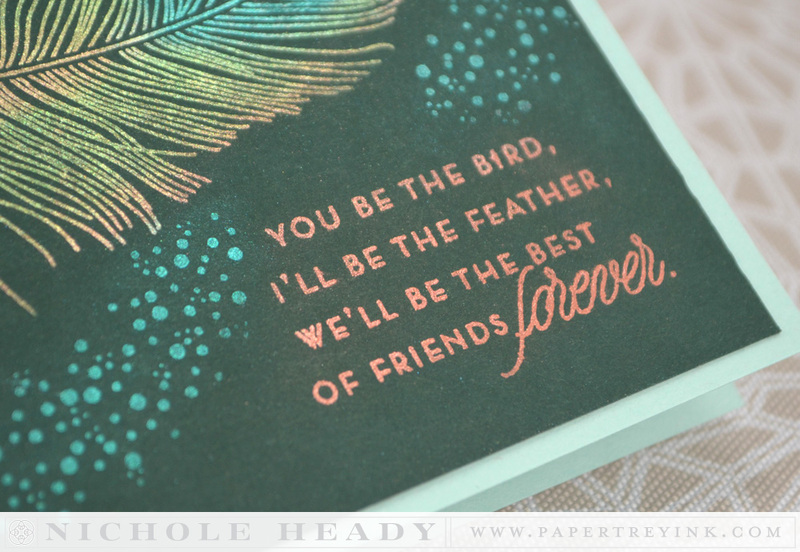 These feather stamps and dies are my favourites of the whole release! Love the new feather! Matching die too – yay for that as well! I think I prefer the feather without the add-ons, but I’m not just sure yet….I adore what Heather did with the black & “white” version. 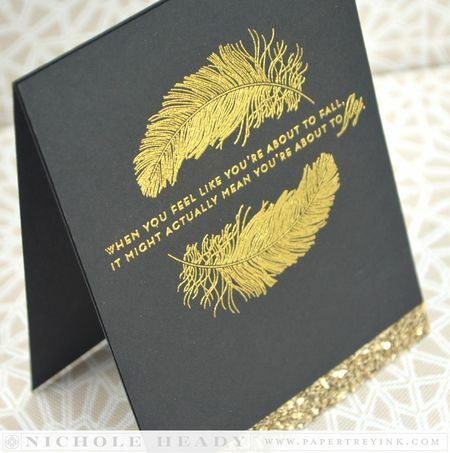 And your black & gold card and also the peacock feather card are just stunning Nichole! Love, Love, LOVE this set – so pretty! I may have to give up a certain demonstrator position and switch. Love how real/delicate the feathers look! The projects are all beautiful! Uhhhh I love the feathers!!!! The feathers are so amazing. Love them. Love the feathers with the watercolor. Great stuff. The peacock card is amazing. . . Just gorgeous. Great eye candy this morning. Beautiful sentiments. And such beautiful cards you have made to showcase them and the wonderful feathers! I love the feathers. So many great designs. I just love these feathers! Very pretty cards everyone. Love the new feather. Nice card ladies (as always)!!! Can’t wait to see everything on the 15th!!! Love all the new releases, and as usual the DT team did an amazing job of showcasing. I am amazed at the detail that showed up even when embossing with Feather Finery! Gorgeous! This feather set is absolutely swoon worthy! The projects created with it are out of this world amazing! OH.MY.GOD. No comments. Just must have. This set will be a classic, I’m sure! Love the addition of the birds to the feather set. Wow the sample with the peacock feather is just gorgeous! I like the sentiments that I’ve seen so far. These are absolutely beautiful! I love the details you can stamp on top of the feathers. Love those feathers! PTI, you rock this trend out of the park! Gorgeous feathers from everyone! Love it all. WOW! The details on those feathers are amazing!!! I’m in love with the new feather images/die!!! WOW! The details on these feathers is amazing! The feathers rate # 1 on my shopping list, Love the sentiments! Wow, such stunning stamps and projects! I love the little dot layer you included!! What beautiful samples!!! They show the creative possibilities of these stamps and dies. Really breathtaking! I love the feather stamp. Can’t wait to get it. I have held off buying a feather set waiting for YOU! Not disappointed in the least. WOW! This is a gorgeous set with truly remarkable examples. I think it has to be added to my collection. What a beautiful feather set! Oh gosh, this feather set is just beyond amazing! I can’t wait to see what the DT comes up with-and as always, the PTI version of feathers has become my favorite! TFS! Oh my, I think I have a favorite!! Love this set & the matching dies – so many possibilities. Thanks for all the inspiration. This set is fantastic!! I loved all of today’s cards! I’m not into the feather craze, but I’ve got to say, these cards are really pretty & 3 of them are just to die for. You and your DT certainly got the most out of your feathery stamps and dies. All were gorgeous. Love these feather images and the sentiments! GORGEOUS projects too!! Thanks for the inspiration! Your projects are beautiful! What a fun release so far! Oh my goodness, the feathers are gorgeous! I can’t wait to play with these on vellum! I’m so in love with those feathers! Love! Them! I am not generally a big fan of feathers (they kind of gross me out) but some of these cards are stunning! Thanks for the all the inspiration … so awesome!! Can’t wait to see the whole release! Those feathers are FAB especially using the Perfect Pearls! The peacock feather is fabulous!! Oh my! Oh my! Oh my! Love love love! i didn’t think i would like this set until i saw what you all could do with it – fabulous! Oh! I just love this set! The feathers are gorgeous. Great detail. Beautiful examples . Absolutely love this new feather set. All of the inspiration from the DT today was fabulous! I think the feather set is the one I am most excited for with this months release! WOW, WOW, and WOW! Amazing cards/stamps/dies!!! I’ve never understood the feather craze…..until today! Everyone’s projects and the finely detailed feathers have seriously won me over!!!!!!!!!!!!!!!! I can’t believe how excited I am for this set!!!!! All of the cards are stunning. However, I believe that the feathers stamped on dark paper are simply breathtaking….they look so real. I love this set and cannot wait to get it. Thanks for sharing all of your talent. The projects are beautiful! Feathers are gorgeous and these seem so real. Leave it to PTI to jump on the trendy bandwagon with this beautiful feather set. And as always, the DT has knocked it out of the park with fancy ornate cards & CAS. This set will be a real hit! Love the feathers! And the perfect pearls peacock feather is amazing! I cannot get enough of the watercolor effects. Just beautiful! The detail on those feathers is just great–as were all the team projects. This is one set I’m putting on my list! the feather is so pretty! This set is just gorgeous ~ along with all of the inspiration from the design team! It is amazing all the lovely different projects you gals have made with this set! I love the sentiments! So many cute projects from the feather set. Thanks for a chance to win. Love how the details add so much to the feathers! What lovely creations! Love the stamp set & dies! Beautiful inpiration for the stamp sets from the designers. So talented. Much details and Gorgeous sentiments! Love all the Fabulous projects everyone! Never thought about using a feather on a project but seeing what you and the DT did, I’m loving it. Another amazing set. I love that you made the feathers large enough to really use as a focal point. Your card with the perfect pearls is gorgeous! Thanks so much. The feathers are so beautiful and intricate! Great illustrating! This feather set is beautiful. The cards are elegant. What fun this set will be! Love the inspiration! PTI hits another home run with this release! Love the feathers! Especially the gold on black version. Lovely! Looooove these modern additions to the festhers! Super gorgeous! Especially the pretty dots, so many color options with those! Thanks for the opportunity to win. Love the feathers. Can’t wait to order. the set with the feathers is a MUST HAVE, it´s so timeless and can be used in so many ways. Thanks!!!! Very pretty set! I especially like the gold-embossed on black card. Simple and beautiful. Feathers are definitely “in”! These feathers are very pretty! Beautiful feathers! I love the gold version – so elegant! The feather projects are beautiful! So elegant but yet still modern. Thanks! I’ve only done one feather project with die-cutting, but with this stamp set I am ready to stamp, emboss, etc. Beautiful! Beautiful cards – I am always so amazed. Those feathers are fabulous! What a great team post day! I love anything you do with Perfect Pearls! Beautiful new stuff! Thank you for all the wonderful inspiration. What a great set. Loved all the different samples from everyone. I really liked the peacock feather. Great name for this set – feathers in all their finery! Yay – so glad PTI has a feather set now with matching dies! Beautiful projects by all! 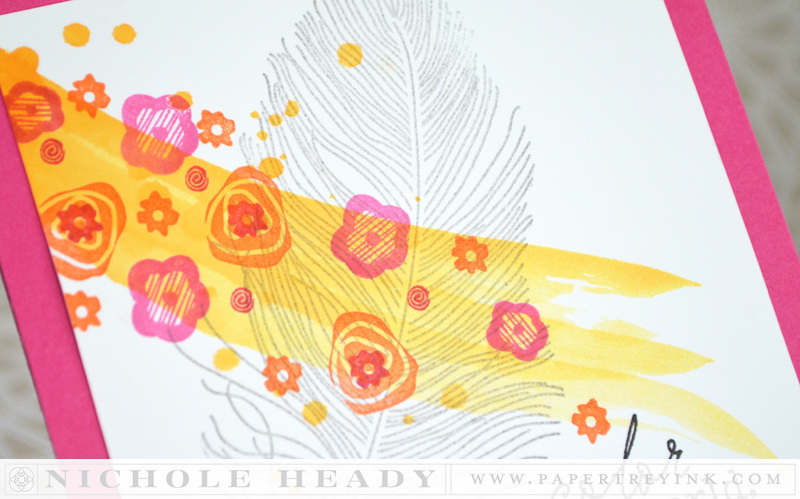 Feathers, feathers, everywhere, and now a stamp to create! I love the feathers. More colors again also. Oh, I just love the feathers! All of your cards are beautiful! Absolutely beautiful! Thank you for creating those dies–love! Oh my Feather Finery is such a fun set! I absolutely love the card you made with the gold feathers! Feather Finery and Words of Comfort are definitely going to be on my list to order. Love them both sooooo much! Feather Finery is so elegant! Honestly, I wasn’t sure how I felt about the feather trend….until I saw these amazing examples that the talented DT created! Absolutely beautiful! I’m now a fan of feathers! I just knew a feather set from you would be awesome! This looks fabulous, I love all the samples!!!! This set is amazing. It’s really going to have me thinking outside my little box of ideas! I have been holding off buying a feather stamp until I found the right one. Well I believe my wait is finally over. Danielle’s card is just fantastic. I’m in. Such beautiful projects to show off the new Feather Finery. The second layers of dots and spots are just lovely! I am seeing feathers everywhere, this set is beautifully executed! Never got started on the feather theme however, PTI may have pushed me over the edge. Love the “feathery” look….so soft compared to others out there. I agree with maria f…. This feather set is gorgeous! Love each and every one of the projects. I wasn’t really sure about this set, but after seeing the projects from today, it will be a great addition to my PTI collection! Absolutely love the last card with the perfect pearls…beautiful! Ooo . . . these feathers are stunning!!! I love how they can take a CAS card and make it fabulous! These feathers are So realistic! Moreso than any other stamps I’ve seen. The one in perfect pearls was my fave. Oh…. that feather set is breathtaking! The inspiration cards worked! I think I’ve embraced the feather trend! Feathers, I love them….so much FUN!!!! Love these feathers especially the peacock will have to go check that one out closer. Absolutely stunning projects. Love all the gold embossing. Love feathers and you did an amazing job with them! This set is gorgeous and so are your projects!!! The feathers are amazing…the detail is just lovely! The feathers are gorgeous! Beautiful projects made with them too! Can’t wait to see the full set! These feathers are amazing. Thank you. Wow, the detail on Feather Finery is amazing. This is going on my wish list! I love this new set and it is definitely on my list! Beautiful projects ! 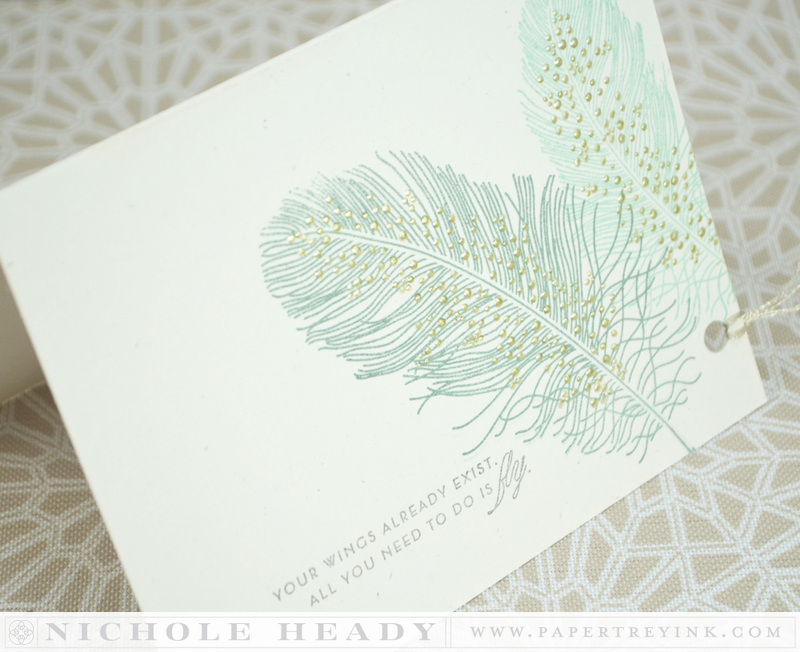 LOVE the style of your feather set….beautiful design and GORGEOUS cards! The black and gold feather card sold me on this set alone! Well done DT on your projects also. I love the style of the feathers, so elegant. Absolutely GORGEOUS creations today! I can’t wait until this release is available in the store!!! 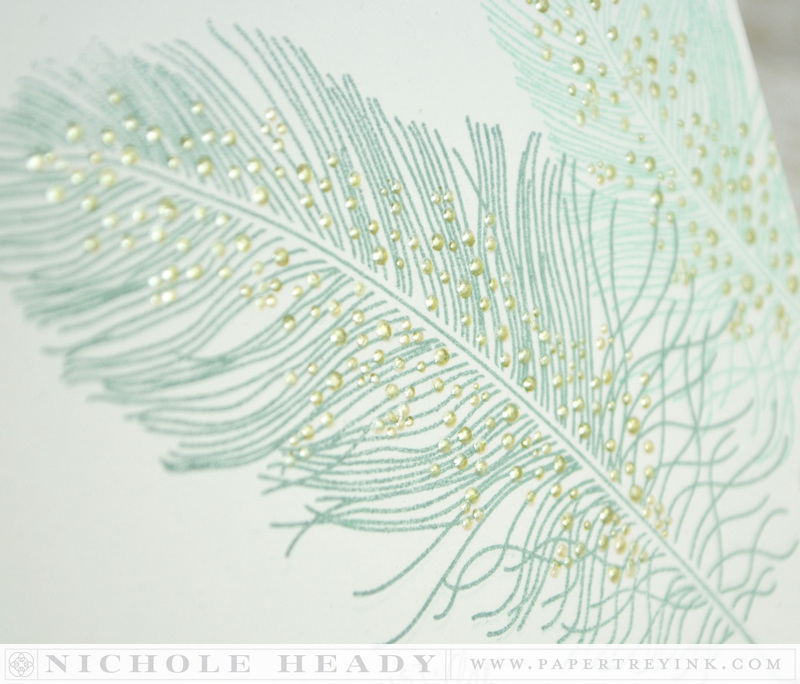 Its hard to go past these detailed, delicate and just plain delightful feather images. Love the array of colours you presented them with. You’ve surpassed even yourself here, Nichole, this is a stunning set … you and the DT have showcased it so creatively and beautifully! Wow! Absolutely gorgeous set and amazing projects to showcase it! I love the look of metallic embossing or Perfect Pearls on the feathers. Thanks for a chance to win a gift certificate! Beautiful new set! Love all of the inspiration! Wow! I love the feathers! So versatile and yet so dainty! I particularly like the way Laura used it! You always come up with such wonderful things!!! Thank you! Beautiful light and airy feathers! love the dots to go over them! OMG! This Feather set is definitely going to get some STAMP LOVE with a lot of my inks and markers. I’ve been wanting a stamp like this for quite some time. Thanks PTI! Wow such gorgeous creation with the new feather set! 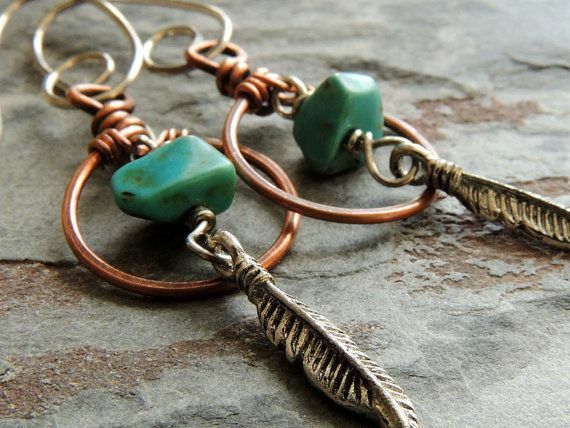 I love the dots element in this set…it gives such a special look to each feather. Again, you’ve taken a trend to the next level! This looks like a beautiful set. Oh my gosh. This may be my favorite PTI set ever! There is not a single sample today that is not drop dead gorgeous! The feather set is gorgeous. The group projects are beautiful. oh, wow! I sure wish I had waited for PTI’s feather set! I love the fine, intricate feathers and matching dies, as well as the sentiments. Great cards, everyone!! The card that featured the perfect pearls was stunning. It looked just like a peacock feather. Nichole, the feathers are absolutely gorgeous. Love the two-step dots in this set. Best feather stamps I have seen! Just gorgeous! LOve the little dots on the feathers! 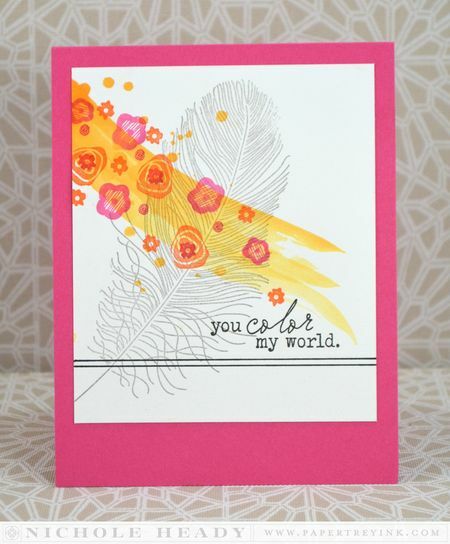 I am so happy to see the “Feather Finery” stamp set and dies! Can’t wait to have this set! I think today’s projects were beautiful! What a gorgeous set! 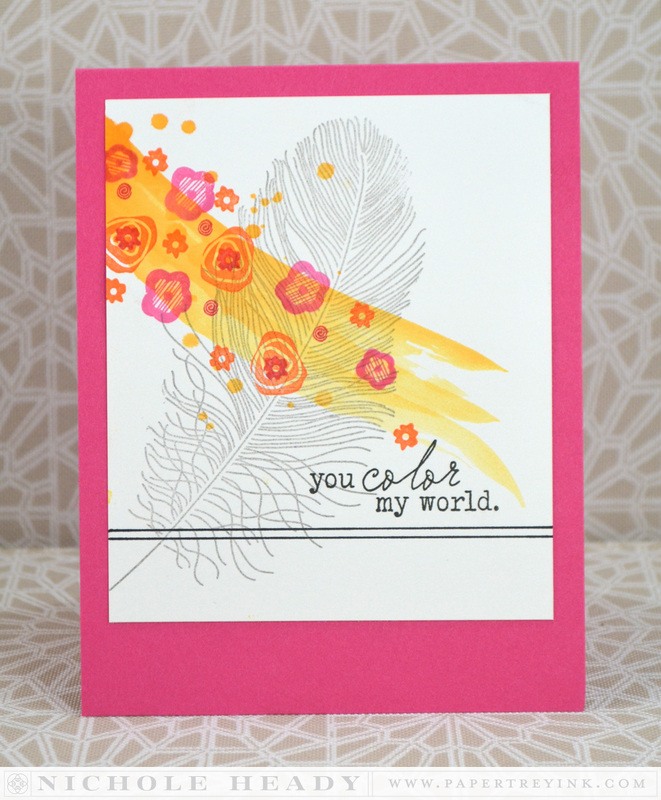 Love feathers and sentiments! Especially love the black and gold card. Just gorgeous! What unique cards today and amazing techniques!! I love this set! The feather is amazing! Love all of the cards! These are my favorites so far!! I LOVE all the projects!! Lots of different techniques today to make these feathers beautiful. Love this set, great inspiration!! Who knew I needed a FEATHER stamp set???! ! ! Well, clearly, I do! These cards, along with those posted by the design team members, are breathtaking. Simply gorgeous. And I absolutely adore the sentiments. What a beautiful take on the feather trend!! Love the details on the feather stamp!!!! Today’s cards are beautiful . . . . just beautiful! The feather stamps are amazing! I love everyone’s projects. I have been waiting for these pretty feathers for the longest time!!!!! Yay!!! Absolutely gorgeous! Just love all the cards with this beautifully detailed feather. Can’t wait for release!. Love how detailed the feather images are!! I absolutely adore the feathers. How beautiful and the sayings great. Wow, what an impressive feather set! So unique and beautiful! I love your projects, especially the black and gold card, and the perfect pearls card! Wonderful! The feathers are gorgous. All the cards are beautiful. BEAUTIFUL!! LOVED the group posting!!! Amazing design team cards and inspiration today! 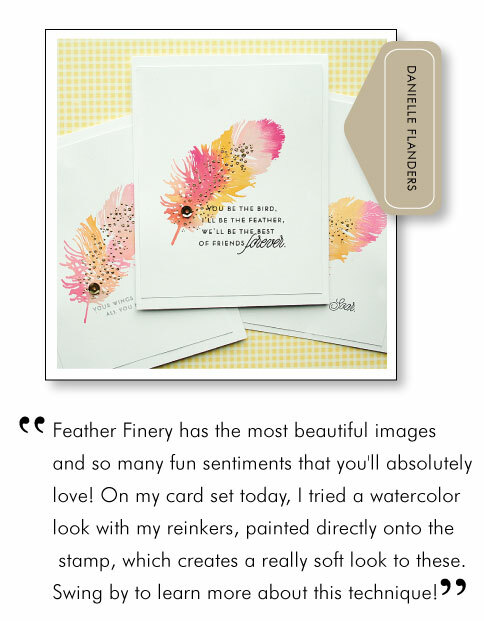 Lovely feathers and fun sentiments! I looooove this new set! I am selective about the more expensive set but this is a must have. I am so excited. I have been dying to get a feather set!! LOVE this one!!! Beautiful projects from the DT. WOW! All of the projects presented today using Feather Finery are nothing short of amazing! Hello, this is THE post I have been waiting for, divine! All of the team created feather finery and I will be adding this to my cart for sure. Great post. Those feathers are great, especially the gold ones. Gorgeous. The peacock ones are pretty too. Those feathers are just amazing. Terrific samples. Thanks for a chance to win. GORGEOUS!!! lovely projects today ladies! The detail that went into this set is impressive. PTI always really thinks things through. oh my my my…these feathers have won me over! they are so gorgeous! I’m excited PTI is doing feathers! What a great set! Thank you so much for designing these stamps!! They are just too fabulous for words! The feather stamps are just adorable and loved all the projects. I definitely love the Feather set. Will definitely add that to my cart : ). Yours and everyone’s cards today were spectacular. What a wonderful stamp set and dies. Love the two step feathers! Unique projects utilizing the feathers as well! Love the feathers! Glad to get a reminder about Perfect Pearls – sometimes we forget things we have had for a long time. I love and NEED the feathers!!!! I love these feather dies & stamps! And the cards are beautiful! I wasn’t big on the feather trend until I saw these cards! Love, love, love them!! The feathers are beautiful!!! I love all the different ways you can use it: embossed, stamped, perfect pearls. The possibilities are endless!!!! Each card from the design team is beautiful. Especially love the feathers. Wow. wow & wow!! I think you saved the best for last! These cards are all just awesome. The feathers are a must have! oooh – the feathers are just lovely!! I have always loved peacock feathers. I can’t wait to get this set and try it with Perfect Pearls. I wasn’t sure about the feather trend. I can’t get over the creativity that is on display. I find the variety from the team so inspirational. These feathers are so beautifully delicate! Loving the new feather stamp set. I have ideas for this one already…. Love the detail on the feathers! I hadn’t been sure if I wanted to get this set, but now that I see the examples Nichole and the design team created, I can’t wait to get my hands on it. Oh my gosh! These feathers are stunning! I do love the feathers! i would use some more than others.. but i love what you did with them all! would sooo much love to win a GC from PTI!!!! LOVE the feather set – you showed some very elegant cards that were simple to do, thanks. This is the feather set for me! Love the “tickled pink” sentiment! So nice to have a feather set. I’ve been wanting to add them to my designs but didn’t want to hand cut them. Some stunning projects to showcase the feathers! Unique and lovely. 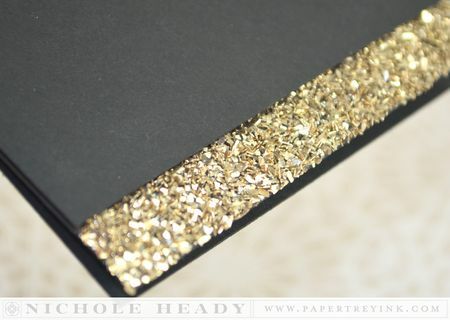 Black cardstock with gold feather is just gorgeouse!! PTI always does it better. Love the feathers. I have been wanting to get a feather stamp set and I’m so glad I waiting for PTI to come out with one. I knew it would be fabulous. I really like these feathers! The feather projects are so inspiring. Thanks so much. Fantastic stamp set and beautiful sample cards – loved looking at them all! 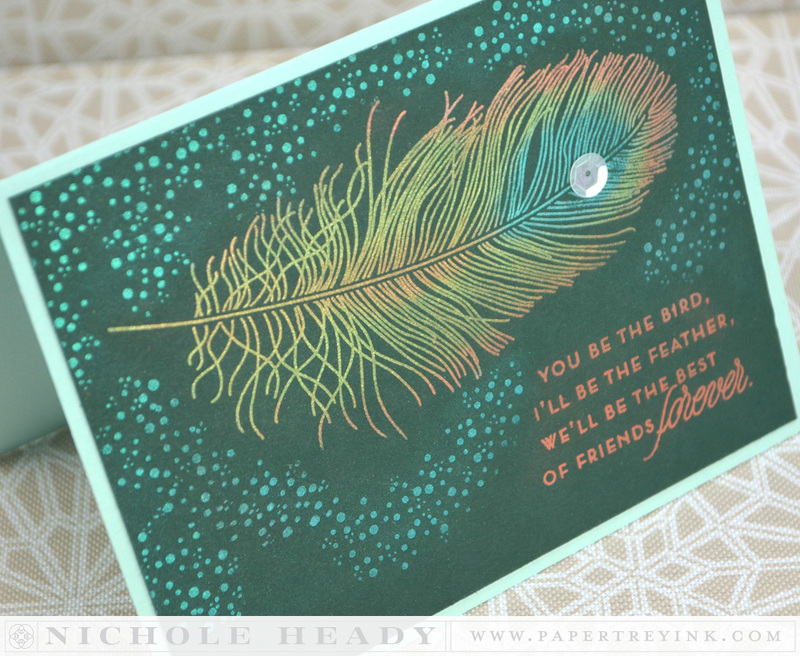 I have been yawning over feather stamps since the feather craze began – until these! I love them……I want them! 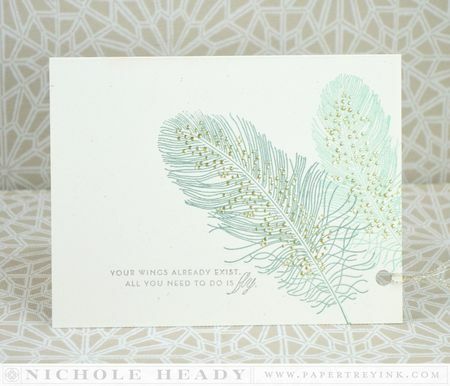 Nichole, your peacock feather card is just superb! These feathers are oh so lovely and your samples are beautiful. A great set that can be used for all ages and for masculine cards as well! I haven’t really been a fan of the feathers. However, these examples just might change my mind. Very cool! Wow! Very different. These are so well done. I can see them as backgrounds in so many projects. The feathers are beautiful!! What great inspiration from you and the DT!! Been waiting for you to do feathers… love it. How about ballet slippers in the future???? 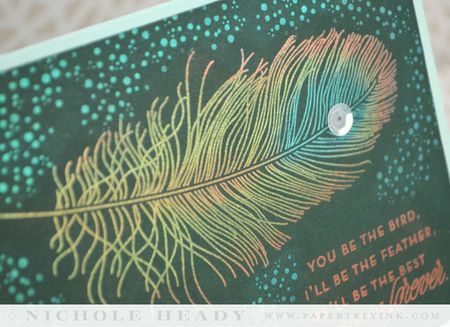 These feather cards are GORGEOUS! Wow, what a group of very talented creative ladies! I think the new feather images are beautiful! I particularly love the speckled look. Very beautiful inspiration! Love them all! These feathers are the most gorgeous I have seen! Love all the cards that you have made! Love how versatile these feather stamps are. WOW on the detailed images of these feathers! I love the gold embossing on black – so striking! I am in love with feathers right now! THanks for a new look! Absolutely LOVE this set!! AMAZING!! And that black and gold card of yours… WOW!! I am so in love with everyone of these cards. Can’t wait to get my hands on the feather stamps and dies! 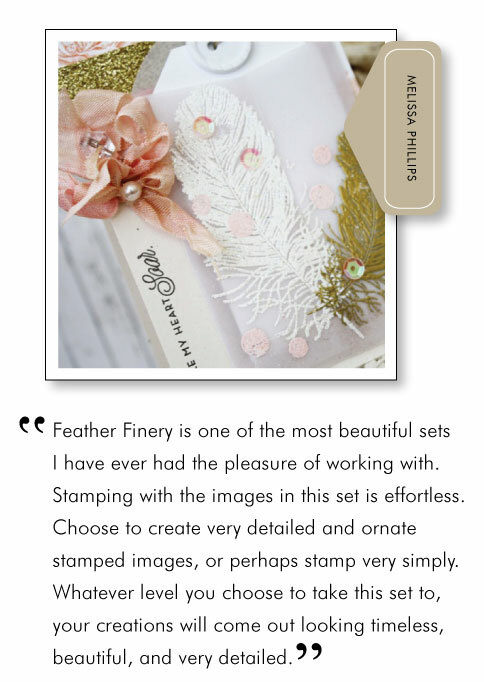 What a beautiful set of stamps in Feather Finery, simply fabulous!! Super gorgeous projects! Great work! Loving the whispy feathers. Would love to try out water colours with these. Love, love, love this set and all of today’s inspiration! Beautiful feathers. Gorgeous projects. Thanks for the chance to win. Absolutely beautiful feathers…love all the details and especially love the extra long feather…so pretty! Beautiful set, and gorgeous projects! I love the feathers! The cards are beautiful and inspiring. The watercolor card is lovely. Wow, the detail in this is just AMAZING! I don’t own any stamp sets like this yet, and it definitely is something I need to add to my stamp collection! Can’t wait! Beautiful feather set and gorgeous inspiration!! WOW!! Love all the beautiful feathers! This new feathers set is beyond gorgeous! Hope you ordered extras! I’ve been wanting a feather set for a little while now but kept holding out for PTI & as always you didn’t disappoint! Nichole & the PTI Design Team knocked this one out of the park! I understand Maile is “feathering” her own nest but hope she knows she’s missed:) I know she would have had an awesome take on feathers as well! Danielle’s watercolor feathers are just gorgeous! I love the add-on spots for the feathers…very cute! All the projects are so pretty, loving the feather images! 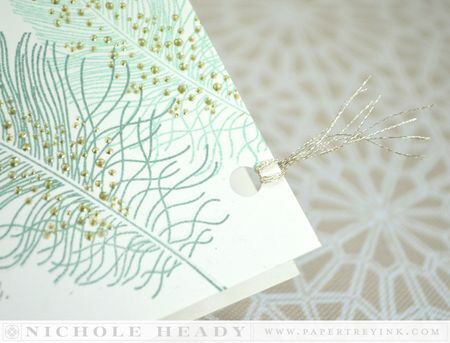 Love the feather card done with the Perfect Pearls. So beautiful! At first I thought I would have no desire for the feather stamp set and than I saw the sample cards…WOW! Some of the most beautiful cards ever made! Thanks for all your creativity! Love the feather finery set. Can’t wait to purchase it and make some new cards! The gold and perfect pearls cards are gorgeous! Love this Feather Set, great ideas love all these cards!!! The feathers are simply gorgeous! My fav is the gold embossed on black. Feather Finery is beautiful. I can’t wait to see the reveal on this one! Lovely work by the DT! This set works for so many different styles. The gold embossed feather on black is stunning! The Perfect Pearls card is amazing! Thanks for the chance to win. Truly amazing stamps and stunning projects!! 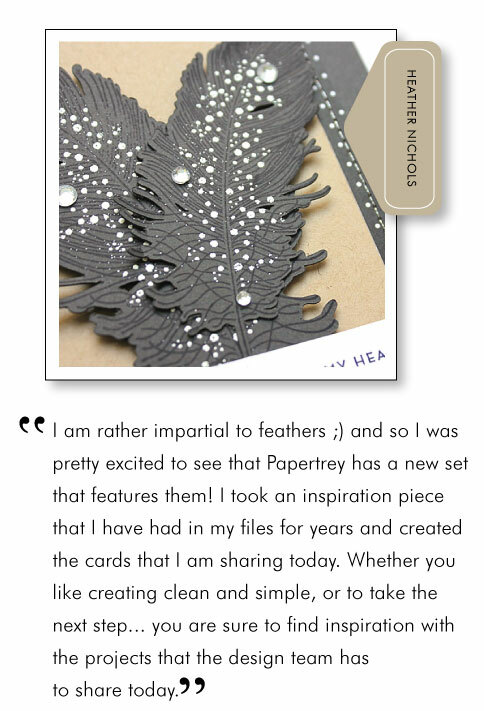 So glad Papertrey finally has a feather set!! Love the bold large images in this set. Thanks for all the inspiration!! This feather set is amazing! I would love to win it! Super beautiful projects today. These feathers are to die for. OMG! FEATHERS! All of the inspiration projects are amazing, I love them and have to get this stamp set! Love the use of perfect pearls for the peacock feather. Gorgeous cards!!! The feathers are beautiful! Love the peacock feather card. Gorgeous! I never knew I needed a feather set, until I saw this one! Leave it to PTI to come up with such a cool set!! What a great set! Love the cards you and the DT made. 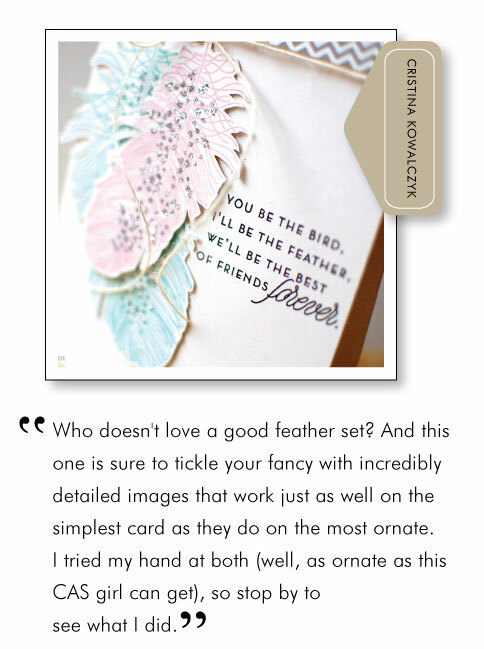 I just adore the feather trend that’s out but your’s are stunning…beautiful cards!!! This set is far above in innovation from any feather set I’ve seen. So versatile, from delicate and feminine to masculine,depending on color choice. Am really loving the gold embossing too! This feather stamp is just awesome..I loved ..loved the cards showcased here !! Love love love the feather images and dies. It is on MUST have list! The feather set is Fantastic, can’t wait to get my hands on it!!! All the cards made with this set are awesome! Be still my heart. This feather set is the best feather set I’ve seen on the market. Love it very much. Must have!! 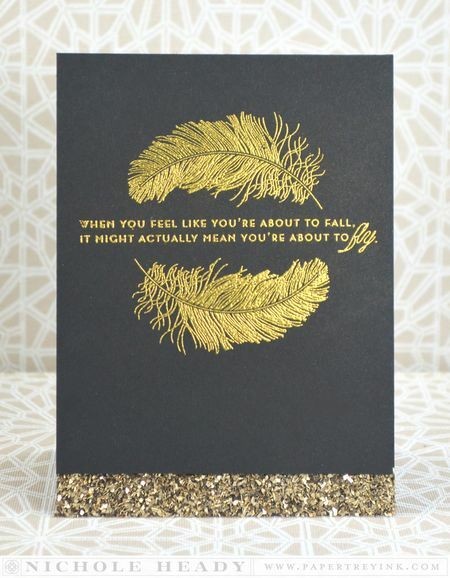 Feathers aren’t really my thing, but I have to say, Laura Bassen’s cards could make me rethink that! Can’t wait to see what everyone does tomorrow! What a stunning set! It’s the best feather set I’ve ever seen! Gorgeous set and lovely sentiments in it too. 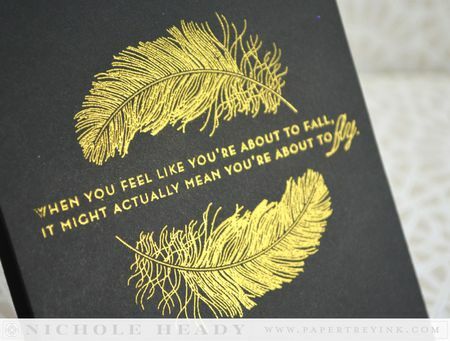 The feathers looks amazing embossed in gold! I like the dotterd layer as well. 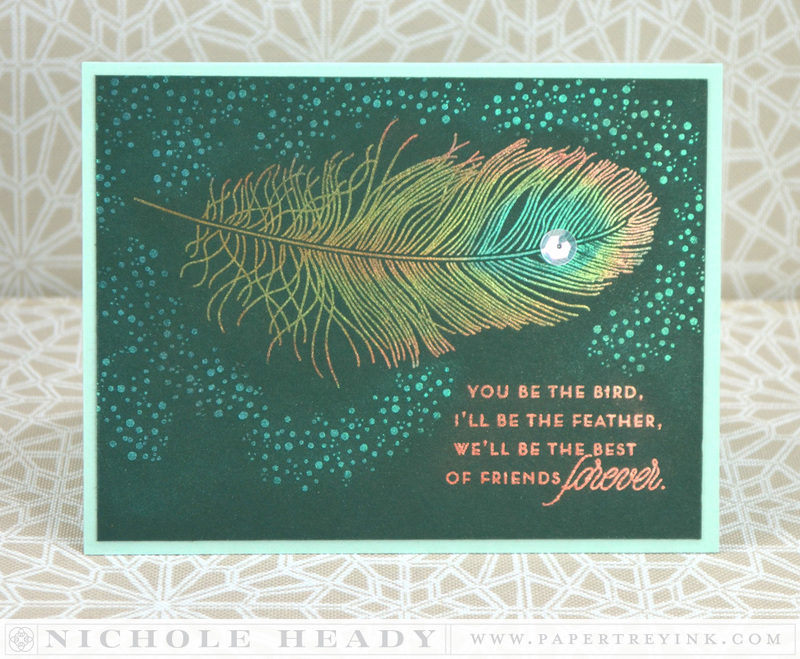 Nichole’s take on feathers is simply amazing. The gold card and the peacock card are gorgeous. Thanks for such wonderful products! Lovely! First time stopping by your site and I’m in love! I knew that any feather set you designed, Nichole, would be stunning and it is. Absolutely exquisite!!! Love the detailing of this set. Gorgeous cards….love the gold one, the gold dots one, the peacock one….EVERY ONE of them!! Feather finery is just gorgeous. I must have this one. 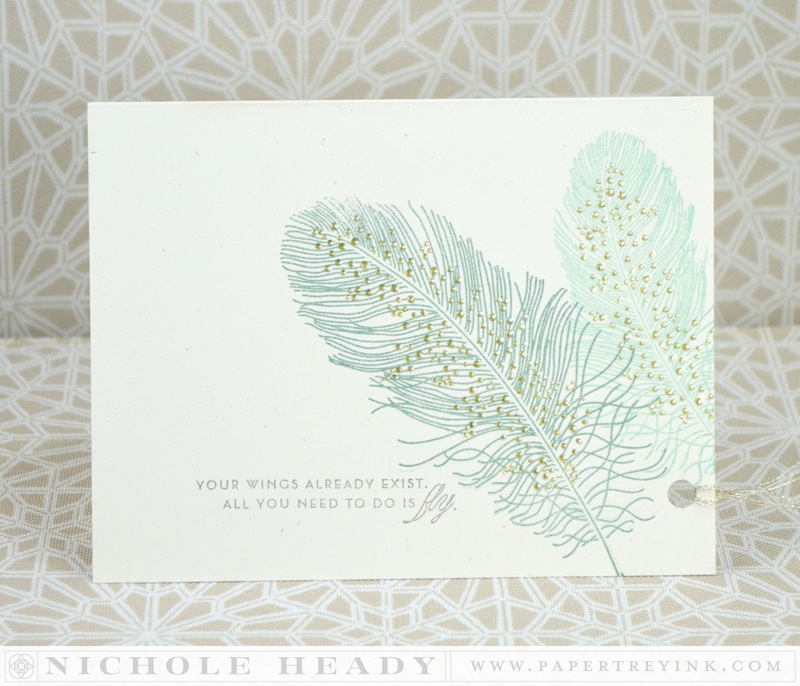 Love the aqua feathers with the silver dots–so pretty! That peacock feather is lovely! Great DT samples too. I really like the variety! Thanks. So delicate and elegant. Love it! Each card is so unique and different in style, thanks for the inspiration. The feathers are beautiful, so delicate! I’d love to see more sentiments to go with them. Thanks! These are the most gorgeous feathers I’ve seen. Stunning projects. PTI always does such a nice job of adding great details to their stamp sets. Love, love, love the last card – friends forever It’s just amazing! This set is really elegant and I can see it being a week used stamp set in anyone’s collection! Adorable. Stuning. I love those feathers. Love the sentiments in this stamp set. I love feathers and there is so much detail in this one! Yeah! Oh my goodness!!! I am so excited about these feathers! I have been wanting to get a good feather stamp but just did not see the one I really liked. THIS IS IT!! Thanks so much PTI! I love the projects that were done with them. So beautiful. Can’t wait to get them and play! at first i didn’t get the feather trend but i love these! Again, these are so gorgeous! There is so much talent here and awesome samples. I could go on….. I have been searching for an awesome feather set and this one is perfect! Not only for gorgeous cards but my art journal, too! Can’t wait for the release! What wonderful feathers…they look so real with the great drawing of the individual parts on the feather. This set of feathers is my favorite! I am completely surprised at my reaction to this set. LOVE IT! The team did a great job, beautiful ideas. I used to we at a string of feathers in my hair in the 80’s. I love all the things you can do with feathers and card stock!